No; from your point of view there isn't any practical difference. SOLICITORS and PROPERTY LAWYERS (also called LICENSED CONVEYANCERS) will have sat very similar, rigorous exams and be experts in their chosen field. They run their departments in exactly the same way, they are both governed by strict regulatory bodies and have to follow stringent guidelines. However there are some differences that, if you are concerned could help you to decide. A traditional Solicitor is someone who may, or may not, have a Law Degree, they will then have spent several years taking exams and in training across a variety of disciplines before they actually qualify. These guys really know their stuff about a lot of things and that is precisely what you want, usually at the worst times of your life. They are governed by the LAW SOCIETY and Solicitors Regulation Authority. Licensed Conveyancers are people who have sat nearly identical, and equally stringent and complex, property law exams. 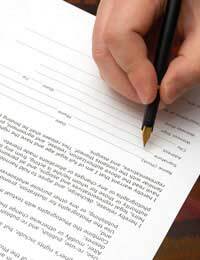 They are specialists in the field of CONVEYANCING and that is all that the firm will deal with. They are governed by the COUNCIL FOR LICENSED CONVEYANCERS as opposed to the Law Society. However, you don't get to that level by continually 'doing the donkey work' to coin a phrase. Most of the time, in both types of firms, the work on your file will actually be done by someone who doesn't have a fancy certificate on their wall, or a list of letters after their name. The thought that whoever is dealing with the biggest purchase of your life may not be qualified scares you, does it? It shouldn't. I myself never 'qualified' however I worked as a senior Conveyancer for nearly ten years; the stack of thank-you cards next to my desk proves that I was good. My old boss has been practising Conveyancing for nearly 30 years; she is not qualified and is one of the most respected Conveyancers in the town. But Who Actually Does the Work? In a lot of firms the conveyancing workload is handled by an experienced assistant, sometimes referred to as a CASE MANAGER or CONVEYANCING EXECUTIVE, they run the file, make decisions and give you the advice you need to make the final decision about any problems that come up. Sometimes, but not always, the file will be given the once over by a senior TITLE LAWYER or Solicitor before you exchange contracts. This system works well and has worked very well for a long time. Just because someone does not have letters after their name, does not mean that they are not more than capable of doing their job. If the firm were to leave an inexperienced person in charge, they would be foolhardy at best and complete idiots at worst. If it should arise that there was a problem on your matter, which was not dealt with, you could have a claim against that firm for NEGLIGENCE. Not the FEE EARNER, the firm. So, you see, it is in their interest to make sure that whoever is dealing with it is properly experienced, if not necessarily qualified. This system works, it has done for years, and you have exactly the same protection against negligence and the same right to complain if you are unhappy. What it comes down to is not letters after the name or status; it is about whether or not you can work with one of these people, or a team of people you have never met before, on one of the most stressful projects of your life. If you need the security of the certificates or letters, and there is nothing wrong with this, then you have the right to ask the firm to ensure that this is done. But be prepared to pay extra. The fully qualified Solicitor or Licensed Conveyancer may well be a Partner or Director of the firm and this means that you may be charged a premium. Just like at the hairdressers, you can have your 'do' done by the manager if you pay extra, but do you actually get a better look? I have said it before but whether the person you are dealing with is qualified or not, and even Senior Partners make mistakes, you will have the protection of a big fat negligence INSURANCE policy to protect you.